I love wearing T-Shirts and always have. When I was pregnant with my little girl I didn’t want my growing belly get in the way of continuing to wear tees, but it got harder and harder to find a good fit! 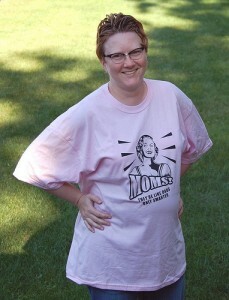 Then I discovered a quick trick to make oversized T’s into flattering maternity T’s. 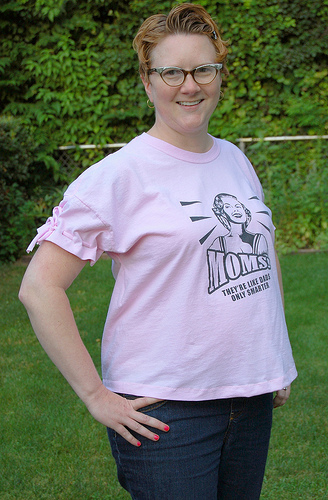 Here’s a look at this easy technique for turning an oversized tee into a fitted maternity tee. First, I started with a T roomy enough for the baby-belly, which means I was swimming in it! Then I pre-washed the T a couple of times to get all the shrinkage out. I hemmed up the bottom of the shirt and the sleeves with a 1″ hem, making sure to leave a little extra length in the front of the sirt for my growing baby-belly. If you have a serger, you can use a blind hem stitch to neatly finish off the seams. 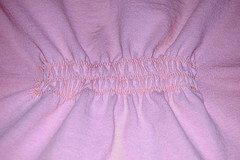 If you have a sewing machine, use a stretch stitch or an elongated zig zag stitch. I also used a technique out of the book Generation T by Megan Nicolay to add ties to the sleeves from extra fabric cut off of the bottom of the shirt. This helps to gather up some of the extra fabric from the large sleeves. Then, the REAL FIT TRICK is adding an elastic gather in the back of the shirt – right below the bust line. This gathers in the top while leaving plenty of room everywhere else! Ahh, now that’s much better! You can use any or all of these tips to help you get a better fit from your tees, too! Next Next post: Baby Blanket Gift: Easy as 1-2-3!